Arizona Roof Rescue, helping our customers around Mesa Arizona, is experienced in thoroughly inspecting every inch of your roof tiles to find and fix the issue in a fast manner. Our main promise is to bring fast responses and bring you the top quality repair that you deserve. With positive reviews in Yelp, Angie’s List, Home Advisor, and Better Business Bureau, we show our clients our clients our commitment and passion in our Mesa roof repairs. Our team of specialized roofers is more than happy to help you get the best quality and durability in every shingle of your roof. We can also replace your roof tiles with the design and color of your choice. A badly maintained roof can bring serious disasters to your home, for example, picture yourself coming back to your home from a shopping day and suddenly you find tiny water drops coming from the roof. Normally, you would think that something like this won’t do any damage, but it can possibly get bigger over the days and once you find your house flooded, it will be already too late. 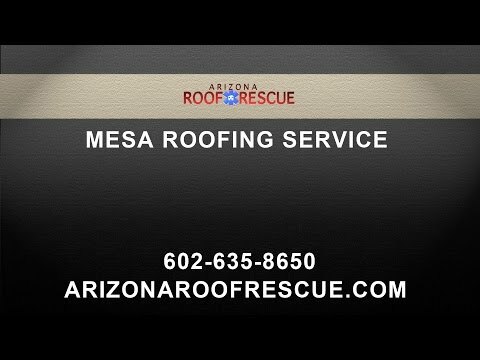 Serving Mesa and areas around it, Arizona Roof Rescue is the roofing company that can seal your roof and prevents roof leaks from happening again. We know your security is important, and that is why we promise quick support to all our customers. Arizona Roof Rescue has been providing quality roof repair services to commercial and residential structures in and around Mesa for years. Our roofing company is locally owned and operated and we consider ourselves to part of your community and our clients as neighbors. To provide top Mesa roof repair services, it is essential to care about your clients. This means, we want our roofing clients to understand their options and give them the best roof for their needs. This is especially important, when dealing with a flawed or compromised roof. A roof that has deteriorated can threaten a building’s structural integrity and visual appeal. When home and business owners notice that their building’s roof has become compromised, they are encouraged to correct this damage as soon as possible. Our Mesa clients can rely on us to help them repair this damage and strengthen their roofs with our expert Mesa roof repair services. We offer clients a variety of materials from which to choose and help them select a repair strategy that will ensure the longevity and appeal of their building. A roof can suffer damage during inclement weather. Strong winds and heavy rains can easily loosen and blow off shingles from the rooftop. After the storm has passed, people may wonder how they can begin the process of repairing their roof. When they call on our services, we can quickly assess the damage and begin the process to restore the roof. In the event, your Mesa roof damage leaves you vulnerable to the elements, we offer emergency roof repair services around the clock. Our team will be dispatched quickly to offer you and your roof, temporary protection until the weather improves and we can devise a roof repair strategy for you. Repairing a Mesa roof on a home can be an urgent matter. When our clients call us for such assistance, we make it a top priority to begin residential roofing repairs immediately. Leaving a roof in damaged condition can compromise a family’s comfort and safety. Even a few shingles that are loose or removed can let in water and other outdoor elements. A leaky roof can lead to mold growth and water damage in the house. These damages can become truly expensive, if you let them go. Rather than let our Mesa clients suffer this inconvenience, we begin the repair process as soon as possible to help families enjoy their homes again. As with homeowners, business owners also want their roofs to be in prime condition. Having an intact roof lets them carry out their daily business duties without having to worry about the safety of their building and customers. When a roof has been damaged or begins to deteriorate, we can take the steps needed to reverse this damage. As a roofing company, we realize the importance of keeping fellow business owners’ Mesa commercial roofs in good condition. When they call us for help, we act immediately and help them select the materials and repair processes that suit the needs of their commercial roofing structures. Helping them choose strategies for their repairs and maintenance. If you are in need of Mesa roof repair services for your residential or commercial roofing structure, contact the roof repair professionals at Arizona Roof Rescue as soon as possible. You do not have to live with a damaged roof. Alan Monzon and his team of experienced Mesa roofers will get your roof back in shape in no time at all, and at a great price to boot. Call us to learn more about our roof repair and other Mesa roofing services including shingle replacement, tile reroofing and flat roof sealing.